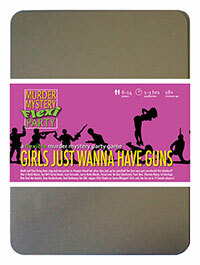 You've been invited to play the role of Puck Mee in Girls Just Wanna Have Guns. Heidi and Paul are throwing their pre-wedding parties at luxury spa and adventure resort, Pamper Island. But after one too many drinks, the bride and her entourage are invited to 'hunt the stag' with paintball guns - and best man Steve Wingman meets a grisly end! Can you find out who murdered him? Grab your guns and get ready for a facial at the luxury spa and adventure resort of Pamper Island! You proudly sport your national team’s kit of red vest, shorts and socks with trainers. If you haven’t left it in your room, you’re usually dragging your hockey stick around too - it’s so useful! I’m Puck Mee, captain of the Republic of Korea’s national hockey team. The bride and I sometimes used to bully-off together when I was at Cheltenham Ladies. Heidi would always get suspended for playing with raised balls, while I was always out scoring. I’ll admit I didn’t really like Steve and I was tracking him down in the woods to shoot him. With a paintball gun of course! But then I ran into one of the stags, Brian, and got a bit well-laid. Sorry, waylaid.